The Citroen C1 used to be a smart pick if you were after a cheap and cheerful city car. The latest version isn't content with being a budget option; it's tilting at the class lead. With improved comfort, new safety and connectivity equipment, and a new-generation engine, it's in with a shot. Earlier generation versions of the Citroen C1 offered cheap, cheerful transport - but not a lot else. This second generation model though, launched in 2014, has tried to give us a bit more, with trendier looks and even the option of a fabric-roof version. But competition in the citycar sector is fierce, particularly from this model's near-identical design stablemates, the Peugeot 108 and the Toyota Aygo, which both roll out of the same Czech factory. Hence the changes recently visited upon the C1 range. You might be surprised at how sophisticated this car's now become. The C1 driving proposition has always been pretty straightforward. It's a citycar that's small, manoeuvrable, easy to see out of and, as you realise very early on jinking about town, very simple to operate. Original versions of this second generation model could be had with two three cylinder Vti petrol engines, a 1.0-litre 68bhp unit and a 1.2-litre 82bhp powerlant. These units have now both been replaced by a brand new Vti 72 Euro 6.d-TEMP engine, which comes with either a 5-speed manual gearbox or a (rather jerky) ETG semi-auto transmission. The auto variant will certainly suit urban-bound folk, people who'll appreciate the light steering and a kerb-to-kerb 10m turning circle so tight that even if you spot a parking place on the other side of the road, you may be able to throw a quick U-turn to snaffle it. When reversing into a narrow bay, it's almost comical how little car there is behind the rear seats and it's worth remembering that you can afford to leave yourself some breathing room at the back. Parking like this is especially easy thanks to the light power steering that'll twirl you easily into the smallest slot. The C1 is offered in both three and five-door versions and there's a soft-top 'Airscape' fabric folding roof if you want it. The car features only minor styling changes in this improved form. The distinctive glass tailgate back panel features a smarter chevron badge and a new Citroen monogram located above the boot handle. The vehicle is signed 'C1' in the latest Citroen typeface, on the lower right side. Otherwise, it's as you were, this car distinguished most overtly by a very unusual front lighting graphic. This comprises of a vertical LED daytime running light above which there's a big round headlight pod with another lighting strip that forms an 'eyebrow' above it. Citroen has clearly worked at creating a visual continuity between the windscreen and the side windows, with a swooping waistline and blacked-out windscreen pillars. The interior of the C1 is bright and airy with a colourful theme. Designed with clean, structured lines, the dashboard features bright colours on the multimedia panel, air vent trim and gear lever base. The door panels also include body-coloured inserts. There are storage compartments throughout the cabin with cup holders and a glovebox able to hold a one-litre bottle. The 196-litre boot isn't very large but it's easy to access, with the parcel shelf folding away when the tailgate is opened. With the rear seats folded, boot capacity increases to a respectable 780-litres. Prices start at just over £9,000 for a three-door entry-level C1. Changes to the range include the addition of fresh paintwork colours. And fresh driver aids like Active Safety Brake, Lane Departure Warning, Hill Start Assist, Reversing camera, Keyless Entry and Start and a Speed Sign Recognition and Recommendation system. The 7-inch infotainment monitor's 'Mirror Screen' smart-phone mirroring capability has been increased and the unit works with both Apple and Android 'phones. As before, the spec on the entry-level three-door-only C1 Touch is rather basic. We'd certainly be tempted to budget another £1,700 and opt for the C1 Feel which can be ordered with three or five doors. Go for five doors and you'll also get the option of the Airscape folding fabric top. Feel-level equipment runs to air conditioning, a DAB digital radio, that 7" centre touch screen and steering mounted controls, along with body coloured door mirrors and door handles. You can go a step further and choose the C1 Flair, which sports 15" alloy wheels and also gets a speed limiter, rev counter, reversing camera, electrically heated and adjustable door mirrors, a leather steering wheel and dark tinted rear windows. Available options include automatic air conditioning, automatic headlights, keyless entry & start and styling details such as black leather upholstery and White and Sunrise Red colour packs. Citroen would have ticked the fail box quite comprehensively were this C1 not particularly clean and efficient. Keeping the weight down to well under 900kg has helped, as has fitting ultra low rolling resistance tyres. Expect just under 70mpg on the combined cycle from the new Euro 6.d-TEMP VTi 72 petrol engine - and under 95g/km of CO2, which is very class-competitive. Insurance groupings range from 6E, which means that the C1 makes a great choice for newly qualified or younger drivers looking for their first car. Here, it'll probably help that the body panels are designed to pop straight off, which makes accident damage cheap and easy to fix. Talking of maintenance, it would be good if Citroen (and Peugeot for that matter) felt able to match the five year/100,000 mile cover that Toyota offers on the Aygo: here, you merely get the usual 3 year/60,000 mile Citroen package. Still, on the plus side, you'll find that most spares are inexpensive, as you have the choice to source the majority of mechanical items from a Toyota or a Peugeot outlet as well as from a Citroen dealership. There's also three years warranty against rust and 12 years of anti-corrosion protection. 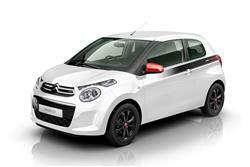 If you�re looking for a new Citroen C1 1.0 VTi 72 Flair 5dr ETG Petrol Hatchback for sale, you�ve come to the right place. At Bristol Street Motors we don�t just have the best Citroen C1 1.0 VTi 72 Flair 5dr ETG Petrol Hatchback deals, we also offer friendly advice and help with all your enquiries to ensure your buying experience is a happy experience.